DIY MRE's/Ration packs: SHOW US YOURS! Re: DIY MRE's/Ration packs: SHOW US YOURS! molawns wrote: WhoShotJR...The vanilla MRE dairyshakes are fantastic. The ones that the Epicenter is carrying is not part of the recall. These are new ones not affected. That does help, thanks. These are definitely going in my next order from them. Bump. Okay, who's going to post pictures? Thanks for the write up. I think the Home made MRE thread was meant more for meeting short term food needs, such as hiking or sustainment while leaving a disaster area. There are a lot of interesting and creative ideas for field stipping MRE's, making home made FIRST STRIKE's, etc, and augmenting them to meet particular dietary requirements or preferences. (children, vegan, etc). Short of opening up my own nation-state, I do not see a reasonable method for planning to eat, long term, from cases of field rations. Welcome to ZS, maybe you could start a thread about things you learned in the Airforce, like water collection in the field when you don't have a commercial filter, or snaring, prepping, and cooking small game? If it's not loaded it's just a rock in your pocket. Hmm this is a great idea. I work about an hour from home and carpool. I had a few field stripped MREs in my bag but packing one of these "home made MRES" would certainly add to the food stash. Great ideas. Thanks for the inspiring ideas, gang. My son and I are always on the hunt for new homemade mre ingredients! For those of you looking for the squeeze pouch of applesauce, they were selling them at Wally World for a little under a buck each. I found a case of 12 of them at Costco just recently for much cheaper than that. I really don't remember how much they were, to be honest. Just thought I'd throw that out there for those trying to make one like the FSR. The applesauce with the spout is a good addition - they can be sucked down with no utensils. I bought a case to distribute into the V2.0 version of these meals that I plan to roll out for camping season. I'll probably ditch the MRE fruit pack and put in two of these. Apollo-11 wrote: For those of you looking for the squeeze pouch of applesauce, they were selling them at Wally World for a little under a buck each. I found a case of 12 of them at Costco just recently for much cheaper than that. I really don't remember how much they were, to be honest. ...Or you can get the real thing. Theepicenter.com is currently selling the original FSR fortified applesauce pouches (formerly known as "Zapplesauce"). The applesauce is fortified with maltodextrin...a complex carbohydrate for long-term energy. Here's my issue, and I don't mean to offend anyone, because these are all very nice store bought MRE knock offs. I have been looking everywhere for "Homemade/ DIY MRE's" and all I can find is store bought knock offs. Has anyone ever tried to MAKE from scratch your own MRE's? I mean make some awesome Chilli or something and then pressure can it in a mylar bag? I am trying it but I would really like help, and someone to bounce ideas off of. I found 1 youtube video and it failed to seal properly. I know it can be done because you can buy MRE's. azurehill1 wrote: Here's my issue, and I don't mean to offend anyone, because these are all very nice store bought MRE knock offs. I have been looking everywhere for "Homemade/ DIY MRE's" and all I can find is store bought knock offs. Has anyone ever tried to MAKE from scratch your own MRE's? I mean make some awesome Chilli or something and then pressure can it in a mylar bag? I am trying it but I would really like help, and someone to bounce ideas off of. I found 1 youtube video and it failed to seal properly. I know it can be done because you can buy MRE's. That would be... awesome. Mylar might require special equipment, but you could definitely box the chili (thinking of the boxes of Stagg I've seen) with a heated rolling tool and a little heat activated sealant on the seam. Are you ready to die, John Walker?| CLAPTRAP! Unfortunately it does require some seriously expensive equipment to process. Usually you spend about $880-$1,000 for a low end chamber vacuum sealer with dual seal bars. Other than foodsaver bags, there really isn't a cheap method to making your own MRE style entrees. For some reason unknown to me, a retort pouch must have the pressure applied to the outside of the container instead of sucked out of the inside. Apparently if you try and conventionally seal a retort pouch with a food saver, there's a good chance it will explode when you go to pressure cook it. Tagged for future reference and projects. I'm just taking up a post so I can reference this later on. Are the MRE heaters each a one-time use? 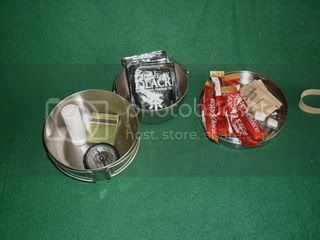 For emergency kit rations (as opposed to hiking rations) would it just be better to have a sterno or alcohol stove you can heat cans, mugs, and little pots with or the MRE heaters? Everything in my ration plans can be consumed without heating, but it sure would be nice to have hot matcha and some hot meals. With a family of six, though, it would behoove us to minimize space requirements and a reusable heat source may be preferable for us if the MRE heaters aren't reusable. Once the chemical reaction happens, they are done. I use a ziploc bags to hold most of my stuff. I also carry the commercial Planter mix, in the resealable bag. 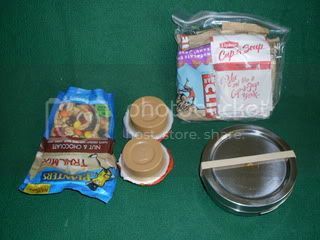 The Ziploc bag shown has 4 Clif bars, 4 of the dry Cup of Soup mixes with the 6 oz (there is a large 19 oz bag as well) of the Planters Trail Mix and 4 each 1.5 oz 'Jif to Go' peanut butter cups sitting next to the cup/pot set used to brew up the items. Freeze dry coffee, sugar and teabags sit in the pot with compass, matches and such. Not shown is an MRE beverage bag with 2 cups of Minute Rice. The rice can be 'cooked in the bag' or added to the soup+peanut butter meal. A second beverage bag holds 2 cups of Fast Oatmeal - which can be cooked in the bag or not. 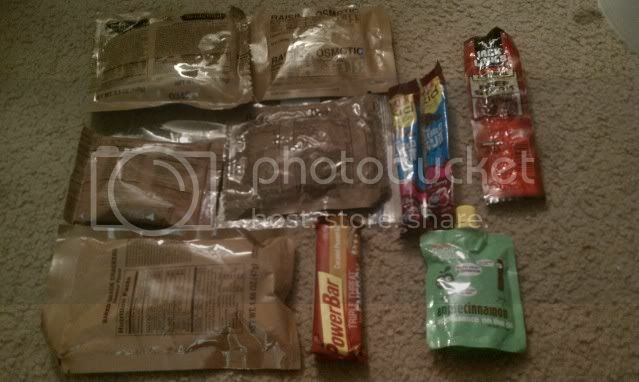 Much of this food can be heated with a variety of stoves, or put in the beverage bag and heated with an MRE heater. By not putting everything in one bag, I think I gain some flexibility for stowage. Normally, I carry a Trangia knock off with a modified Esbit stove as an alternate. Warm food isn't just a luxury here, it can be the difference between hypothermia or not. Shelf stable, fully cooked tinned Tilapia. Not gonna lie, after a long day in the woods some hot teri tilapia and instant pasta or rice sounds damn good. If you like those, the dollar store has these. ZombieGranny wrote: If you like those, the dollar store has these. Going to have to check those out too, thanks! sigboy40 wrote: The Sigboy First Strike Rations! These applesauce pouches are really easy to find from multiple brands nowadays and my kids (they're older kids, not little bits anymore) still think they are just the awesomest thing. They are bothered that I make them eat applesauce out of a jar when there's no emergency going on while these sit in our emergency gear. They really love when they get close to expiration and they get to eat applesauce out of a pouch! I agree with you that they are a bit small. I'd like to see a manufacturer come out with a larger pouch. For now, I consider a serving two of these. Anianna wrote: I'd like to see a manufacturer come out with a larger pouch. For now, I consider a serving two of these. First thought: Zapplesauce, 4.5 ounce pouch.